This paper revealed urban axis and city shape identity that influenced by its concepts and present activities issues in ‘Lan Na’ historic cities in northern Thailand. This study using space syntax technic called axial line analysis combined with GIS analysis, to examines how history geo-politic issues have influenced to its urban axis and network. Results show urban axis has highly coexisted with its city shape determined through high integrated axial lines. This city shape was, however, defined by its establishment concepts as ‘Sankh’, ‘Traiphum’ and freeform. Different shapes of urban axis have been determined by these concepts. As well as the largest public space in some ‘Lan Na’ historic cities, it directly attaches to high integrate lines that represent as urban axis core. However, depending on gradually develop influences, the function of public space in urban axis core has various types. Mostly, these spaces, have related to Buddhism religious usage or colonialism spaces. Settlement pattern using kernel analysis revealed that residents in every city settled in a tranquil area determined by space syntax. Additionally, settlement clusters adjacent to urban axis or high activities traffic. In summary, from reviewed historic cities in ‘Lan Na’, it found that this urban axis could be identified using multi-method. To enhance urban axis in historic cities, both object and subject aspect had to be revealed to apply as delicate historic conservation measures. Historic cities in term of historic civilisation consist of location, morphology, and physical aspect that different, correspond to its environment. They are, mostly, built with indigenous of local belief and wisdom which reflect human legacy on how its settle altogether with a traditional, economic, political and spatial aspect (Rapoport 1990). Even culture usually affects behavior pattern of communities more than the environment as same as a general belief but the environment is shaped by these major factors because it includes as part of the habitat limit and the restraint of human livelihood (Strange 1997). The existence of historic cities in modern era merit us and bring us self-esteem of residents. Therefore, Belief, politic, and tradition, laid groundwork, involves not only in physical planning but as social cohesion for residents in those cities. This may lead us to understand more about how and what element chooses to be to preserve and make an appropriate choice by amplifying important of this element. As reasons mention above, this study seeks to understand how urban settlement belief reflected through its urban axis that response and retain to its residents in present-day. In recent day, due to rapid urbanisation level especially in developing country, this may lead to proper policies in the spatial improvement of historic cities. Urban axis is one of city element that must be intentionally set-up with highly geographic consideration these axes usually served as a war-time main channel, inherit cultural activities, encourage main architecture or wayfinding for residents. In South East Asia, historic cities usually influenced by “Traiphum” or three worlds (Heaven, Earth, and Underworld) (Winichakul 1994; Soraya 1999) the concept for prioritising important level of architectural location on its axis. To study, the urban morphology of accumulate structure of cities, in this paper try to investigate how ‘Lan Na’ cities—inherit the kingdom in northern Thailand—and city of Sukhothai (main influence of Lan Na’s capital city shape concept during its time) response to its urban axis in recently. This study interpreted how the urban axis of historic cities comprise to an overall spatial configuration using space syntax combined with GIS analysis method, meanwhile, revealed public spaces and residents settle influenced by or for those axes. This may prove public space in historic to be useful as cultural-space-place by revealed its urban axis and city shape, simultaneously. The questions considered in this study are issues as follow: (1) How core axis of historic cities determined by its shape, integrate to an overall recent-day urban network? (2) How public spaces related to this axis or other highly integrate lines? (3) How residents settled in these spatial networks and Is it consistent with integrated lines in the various situation of cities? In the northern part of Thailand, cities have evolved through time. From the 1200 s, cities in this part influenced by Lan Na culture which consists and composes of various tradition and belief. Lan Na’s protohistory was pre-occupied by ‘Mon’, ‘Tai’ and ‘Lua’ ethnic groups, Cultures which was Buddhist-animalism settled in that period (The Office of Royal Society 2003; McDonald 1871; Stratfor 2006). Lan Na has consisted of several cities in northern part of Thailand, part of Shan state in Myanmar and a partial area of southern China. From various minorities, Lan Na was formed and established a kingdom where Chiang Mai was appointed as the capital city, its shape influence by Sukhothai (Fig. 1). These led Chiang Mai to a settlement in the form of an aggregate group of belief and emerge of indigenous tradition—show in the intention of city shape—in which historic cities established (Ongsakul 2010; Guntang 1990). In term of urban planning, physical and non-physical collided, usually consist of spatial structure, economic fabric, and social hierarchy or equity, however in historic cities, another element has to be included in design element which is the spiritual dimension. In Lan Na city, concepts of city shape also repeatedly applied to response with an essential function such as defensive, festive, religion and daily activities, however as a city, it also evolves and/or reflects its space through time and influence. This evolving and developing lay more complexity in multi-dimension that needed to be clarified which analysed by this study. To understand spatial structure of Lan Na historic cities, it unavoidable to clarify its influences in term of geo-politic and social fabric, in this paper, its shape and city form which transform or sustain shall be explored. In several indigenous cultures adopts its character and auspicious meaning into city shape. In Thailand, at late of agricultural age, urban culture has been formed since 600, CE these cities scatter in northern, eastern part (Chareonwong 2008). Most of the cities, governed in sort of cultural center more than the Territorial Kingdom or state. In begin of urban age, these cities have shaped as a basic figure such as circular form, however since cities also the center of socio-economic it received many belief and indigenous element from India culture especially Hinduism and Buddhism which widely spread and integrated to a local belief of animalism (Winichakul 1994). These religious cultures convergence, are still present to recent day, in a form of the historic city’s boundary by its moat, wall, and anthropological evidence. Lan Na, as cities shape concept, translates and combines ideology and indigenous of city concept influenced by the shape of ‘conch shell’ represent through its prosperity and animalism meaning. This shape represents as an auspicious object as shown in many Hindu chronicles. Gods in Hindu usually possess with conch shell to use as signaling in the time of war, from this reason, this object was exemplifying as an auspicious shape that links mutual realm and spiritual realm together. The shape of a conch shell was widely used by Indo-Pacific belief. Conch shell in original word in Sanskrit called ‘Sankh’, in several cultures it also represented as shell money. As religion instrument, it uses as a ceremonial trumpet during worship at temple or home (Gupte 1994). One of Hindu god, Vishnu, god of protection and preservation hold this instrument to represent as life giver which explain by its shape and infinite water that originate from its (see Fig. 2a). Another Concept widely used to shape the cities, distribute throughout Asia, is imitated from cosmography called ‘Traiphum’, especially in Hindu-Buddhist religion. Origin of this concept may crystallize in India then widely spread through commercial trade. These consist of each realm divide by each sea, centralize by the highest mountain which Himalaya mountain or ‘Sumane’ represent as its central, inner rim are 7 continent circles divide by sea, outer rim are 4 mountains in each corner represent 4 continents of world realm and beyond this mountain is the infinite sea. However, these extend 4 continents added by Buddhism to imitate philosophic element to divide finite and infinite universe and importantly imply natural direction. As 4 continents represent living realm, those 7 circles represent as semi-heaven or auspicious forest and sea, highest peak of Himalaya represent as the heavenly realm. This concept as shown in Fig. 2b, frequently uses in various dimension and scale in Hindu-Buddhist as ‘Traiphum’ (3 realms of the universe) from the main decorative of the temple to a shape of city form (Jumsai 2008; Winichakul 1994). These concepts of city shape still appear in major cities in the northern of Thailand in form of its boundary (Moat and wall). Additionally, important subjects that might reshape Lan Na cities by its indirect influence was Colonialism from western. In 1850–1910 was called modernization period, Centralization to Bangkok (Thailand capital) has been promoting and set up. The new government had widely introduced especially in upcountry including Lan Na territory. This movement aimed to sustain sovereignty of country by diminishing political power of local which independently govern by themselves in that time, moreover, the main objective of this movement was to prevent reduce Colonialism effect in a region (Ongsakul 2010; Tansukanun and Duangthima 2013). The western economic system also introduced and developed into Lan Na region, Wood industry and the inter-trade commercial was settled mostly in the area because of rich resource of teak woods. In this period, Lan Na was highly affected by its rapid development, governor who was royal monarch from Lan Na kingdom were gradually vanquished by direct and indirect political aspect through re-assign or transform new governor and administrator system from central government (Jarernmuang and Apavajaruta 1986) and indirect spatial-spiritual aspect such as establish of government or commercial usage into auspicious or palace area which replace traditional buildings to colonial style buildings (Guntang 1990). These traces still found in the recent day mostly in Lampang province due to it was a node of transportation in commercial and wood industries. Most of the colonialism influenced by its land use, especially in the urban axis. In summary, as shown in Fig. 3, according to issues mentioned above, Lan Na historic cities has shared concept and transformed from time to time. Urban morphology studies usually study on how city develop and transform to represent its embedded history. This study focuses on its network, however, apart from the movement of the urban network is included, other urban historic contents such as present-day settlement, geo-politic influence, and its condition are also used to exemplify how the urban network was used to prioritizes space usage. In this study, urban morphology divided into its spatial aspects as mentions above and combine with a function of human activities, which represent by space syntax that determines how the network was related to totally cities concept and its influences. In this study, historic cities of Lan Na kingdom were evaluated by space syntax analysis overlay with GIS’s kernel analysis. Historical contents also regarding relationship with spaces that evaluated by objective tools. The result will be discussed on important of spaces prioritized by tools according to their subjective contents (see Fig. 4). In urban morphology studies, leading and shaped up by many European schools’ approach—the analysis of urban form influenced the northern European historic cities. In urban morphology analysis these studies suggested generally categorized in four elements; Site, street, plot and buildings block (Conzen 1963, 1960). In Conzenian urban morphology school focus on the architectural concept of these ‘tissue’ or urban fabric which determined by its own historical evolution (Whitehand 2007; Oliveira 2016). Methodology expanded in more detail by Caniggia studies, separated between city and buildings, and subdivide into 4 subcategories consist of Element (material), element of structures (floor, wall), system of structure (rooms and stairs) and system organism (whole shape of building/city) (Caniggia and Gian 2001). From the development of urban morphology studies, both Conzen and Caniggia school defined the city as a whole that able to divide its categorized, in 1993 Karl Kropf established a consistent of morphology analysis combine with time and energy of a city. This emphasized of study created the relation from the part to whole, from material to urban tissue, which leads to a hierarchy of built environment (Kropf 1993). Recently in 2008, Paul Osmond invented further step of morphology studies, using space syntax as a medium integrated the Kropf’s hierarchy categorization (Built form) and open spaces (Osmond 2008). From Conzenian-Caniggia school to the study by Osmond, the urban morphology trend to understand the complexity of city develops more profoundly clear to reveal urban fabric. New method proposed by Osmond using space syntax led to a comprehensive approach to categorized and finding a relation between an urban street and open space. This study adopts this methodology to understand urban morphology as the relation from parts to the whole. Moreover, to understand the urban morphology, order of priority in elements shall be revealed, in urban system of the street using urban axis, in building settlement using its density. The combination of these elements will, finally, overlaid and discussed according to its subjectivity of history. Firstly, to explore the urban system of streets, an axial map in space syntax was combined with GIS to comply as a research tool to identify urban spatial networks in the existing condition of Lan Na’s cities. Axial map analysis methodology is analytical techniques used for quantifying the relation between spatial configuration and social cohesion (Hillier and Hanson 2003). According to space syntax method, notes the total depth of line x and represent the depth between line x and i according to an angle of turning by 0 angles mean 0 turns to 180 angles mean 2 turns. In 2nd, 3rd and 4th step, where is the mean depth of an axial line, is a number of axial lines put in the calculation, is Relative Asymmetry, is Real Relative Asymmetry weight by D value in (5). Finally, Global or Local integration (6) is obtained by calculation, simultaneously. However, to use the syntax analysis, it has to prevent ‘edge effect’ of a test environment (Ratti 2004), buffer from analysed area expand to 800 m or more using a walking radius of residents as a relevant model boundary (Hillier and Penn 2004; Gil 2015). Secondary, settlement data obtained through GIS dataset, as point type, kernel analysis was used to identify aggregation or segregation of settlement in cities. In many morphology studies usually used building plot and/or building arrangement. However, to prioritized and created clear image of settlement situation, the gravity model of kernel density analysis was chosen to evaluate the settlement in this study. This kernel analysis weighted by its height through its number of building floor(s). A level of aggregation displays by gradual from blue to red color, the higher density of settlement shows as red which clarifies how a closer point of settlement cluster together throughout the city. The results will overlay with integrate axial map of urban system of street and be discussed in corresponding with its settlement. Finally, to evaluate the relation between Objective and Subjective of urban morphology overlaid mapping between syntactic properties of the urban system of a street, the location of public space and kernel density of settlement was created. Syntactic properties of an urban network within the particular shape will define the urban fabric as a whole while the urban elements consist of a settlement of residential buildings and public spaces were evaluated and identified, simultaneously, to reveal the elements of morphology as a part. A settlement was calculated by kernel density method; historic contents were reviewed to clarify the relation of subjectivity and urban morphology evident in in overlaid figure. This relation between historic review content and urban morphology analysis, combined with the current situation of the city, will be discussed to provide the urban conservation perspective in the analysed city. This study used typology of city concept. Each city will discuss in its properties. Present-day urban morphology in clear-boundary cities are analysed consist of (1) Lamphun, (2) Lampang, (3) Phrae, (4) Chiang Saen, (5) Chiang Mai, (6) Sukhothai. Lamphun used conch shell or ‘Sankh’ concept applied to city shape. Like historic cities and other communities in this region, Buddhism has spread throughout the region, Lamphun also implies idea and shared the belief of Buddhism. Lamphun was capital city in the kingdom called ‘Haripunchai’ were established in around AD 667 (Ongsakul 2010). Haripunchai had high influence by ‘Dharavadi’ which directly receive cultural influence from India including Buddhism and belief (Damrihkul 2004; Lamphun Provincal office 2000). Haripunchai or Lamphun had influence in a northern region of Thailand in that period and represent as one of the historic city that significantly used Sankh concept show in city moat. 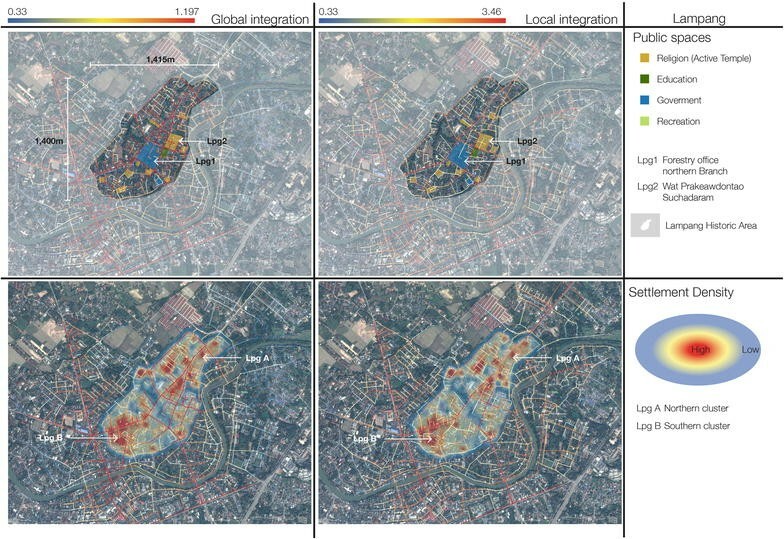 Syntactic property of Lamphun’s urban network in present-day shows an individual line of the highest integration (Global Integration: 1.24, Local Integration: 2.96) in the most central of a city along with north–south direction (Inthayongyot street, see Fig. 5). Global integration value of city ranges from 0.44 to 1.24, Local integration range from 0.33 to 2.96. Both integrations have shown gradually distribute of value from the city center to city moat or perimeter as highest to lowest, respectively. This feature of an axial line when overlay with public spaces shows significance relation with its location. Accord to the finding, its attach with the most important religion space in a city called ‘Wat Prathat Haripunchai’ (Lpn1). Moreover, highly integrate line also attach with government quarter (Lpn2) that locates in a northern part of the city consist of city hall, Officer residential, and Museum (Lpn3). Most of the government quarters establish in an early modernization of Lan Na which determines by the central government in Bangkok due to counter-colonialism agenda by that time. The result from Integration and settlement aggregation overlay shows the south-east area of the city, seem to has highly aggregation of settlement more than another area. However, as shown on the overlay map cluster of aggregation may divide into two clusters consist of northern and south–east areas. Northern clusters (Lpn B) attach to axial lines where a value of Global integration ranges from 1.11 to 1.24. This northern part located government officer’s residential area. South–east clusters (Lpn A) attach to axial lines where a value of Global integration ranges from 0.82 to 1.01. This part has different character compare to northern clusters; it comprises of the commercial and residential area that may affect to created more livelihood than northern clusters. Most of the settlement aggregation areas locate in an intermediate value of integration of axial lines and nearly attach to north-end and south-end of highest integrate of axial line. Current situation of urban conservation in Lamphun, Lamphun historic area has been included in the first group of historic city category by city conservation committee of Thailand (The Secretariat of the Cabinet of Thailand 2011), according to city Land-use comprehensive plan Lamphun’s historic area determined to be cultural identity use only (Department of Public work and Town and Country Planning 2003a). For conservation plan, despite the most important elements such as city moat, city wall, and architectures, Street and urban corridor are one of the elements of conservation (Lamphun municipality 2016) however urban network and its public space high integrate street may have potential to be chosen as historic street such as Inthayongyot street. Other streets in the historic city apart from residential clusters could be included as phasing process of historic street conservation planning. Similar to Lamphun’s historic city, Lampang’s historic city also adopt ‘Sankh’ concept of city shape applies to it city shape, however, Lampang has superimposed 3 historic cities which developed through time located on proximity area in the city center. The oldest one has identical shape of ‘Sankh’ in faintly city moat as shown in Fig. 6. Even trace evident of city moat is indistinctively appear but historic archive record and city gates existence determine it the gradual border of city moat. Share the same establish idea and period of ‘Haripunchai’ that capital by Lamphun, Lampang is an important node, located on the largest plain in northern of Thailand—it represents important satellite city during Haripunchai kingdom (Damrihkul 2004). It still acts as a junction of many cities from the past to present-day. In addition to important junction city, in the colonial period, Lampang was determined to be a center of wood industry which established by English companies at that time (Supadiloklakha 1998). These industrial activities highly influenced usage of land-use which may transform some spaces into industry-related usage. Urban network of Lampang from space syntax analysis shown that high value of global integration consists of 3 connected lines, two of them parallel to north–south axis, another one is aligned in east–west axis and link first two lines together (Global Integration: 0.95–1.19, Local Integration: 2.16–2.51, East, West and North line of Lpg1). In summary, global integration ranges from 0.33 to 1.197, Local integration ranges from 0.33 to 3.46, these group of high integration also create ring-like shape inside the boundary and outer rim of this group is shown low integration ring of axial line (see Fig. 6). However, Local integration value significantly differs from Global integration, besides same axis cores as global value, the high local value of axial line also distributes to the boundary of urban network. In addition, high global integration attached with a vastly vacant area used to occupied by the wood industry as an office of forestry northern branch. This space transferred from a different owner, influenced from the colonial period it acted as English wood company office which later reverted to the central government in the counter-colonialism period. These axis lines also attach with religious space where Buddhism temple ‘Wat Prakeawdontao Suchadaram’ located. It also largest temple in this historic area. In summary, two largest public spaces attach with the high value of global integration axial lines, it can represent multi-connected line or area of city core where activities inflicted by its periodical history. Kernel analysis of settlement shown many clusters of settlement distribute throughout historic area, however, it could be divided into 2 major clusters which are northern part distribute along with single main road and southern cluster in agglomerate communities. In addition, some of the small clusters have occupied in the eastern and western area of cities. This result shows significantly, how, habitants settle in present-day in a historic area. The study also shows a result of the overlay with space syntax properties, Major clusters attach to low integration lines where northern cluster global integration ranges from 1.03 to 1.197 and southern cluster ranges from 0.88 to 1.159 however it may explain through local integration lines overlay. Local integration overlay result shows a distribution of high-value traffic comprises with clusters of the settlement, it shows whereabouts habitants settled decision to choose on tranquil of low integrate lines in Local integration value. A Shared feature of similarity to Lamphun’s historic city overlay result, still, shown these clusters adjacent to axis core at north-end and south-end. A different feature of cluster character is building usage. In a northern cluster, ribbon development along the road determine it as residential-commercial mixed-use area. In a southern cluster, due to it secludes and tranquil character, it determines to be a residential area where temple act as the center of a community. In recent-day Lampang historic city has been included in 1st priority historic group determined by city conservation committee of Thailand (The Secretariat of the Cabinet of Thailand 2011) which share similarity to Lamphun historic city. According to mentioned resolution, Lampang initiated activities concerning about historic area conservation in various perspective (Lampang Municipality 2015), in the comprehensive plan this area determined to use as culture and city identity encouragement only (Lampang Municipality 2007), in strategic plan significantly encourage streetscape in the historic area. To implement those plan, this study suggests highly integration street as a center or initial place for tourism information due to the possibility of public space reinvention such as the northern branch office of forestry in middle of the historic area. Phrae’s historic city locate in Yom river basin, this city attaches and parallel established to Yom river. Phrae historic city directly influences by Haripunchai ‘Sankh’ concept, its shape distinctively shows city moat correspond to ‘Sankh’ shape. This city approximately established in 878 by influence from Haripunchai then Khmer empire which periodically ruler of this city (Damrihkul 2004; Ongsakul 2010). In 1847, the preliminary period before Thai-kingdom officially established, forestry industries led by British private company occupied many areas in northern Thailand including Phrae to be branch office (Barton and Bennett 2010). From this major, similar to Lampang, Phrae had highly involved and influence from forestry industry during that time. Evidence of influence shows in wooden houses, architectures for royal family scattered throughout the area (Valipodom and Songsiri 2007). Events and activities in Phrae highly involved in developing and transforming the spatial aspect of the city, to counter colonialism, many development symbols established such as provincial school, Governor Manor (Formerly Lan Na royal family Manor), forestry school, etc. These intuitions represent as symbolic determined by the central government as territorial government by Thailand (Suvannakads 2013; Ministry of Interior 1985). Phrae is one of important satellite city, from the past to present, it was collision space of political and social issues that fortunately maintain spatial evidence to investigate until recent-day. Syntactic properties of Phrae historic city show the highest integration lines locate in center-south of the city where global integration values range from 1.22 to 1.31, however, local integration almost similar to global scope but it moves to the northern part of the city which range from 2.70 to 2.982. These lines connected into inner-ring urban axis inside historic city’s boundary determined by its moat (see Fig. 7). In summary, it shared a similarity in the spatial configuration of Lampang, global integration ranges from 0.44 to 1.32 while local integration ranges from 0.33 to 2.98. Overlay result with public spaces shows correspond to urban axis identified by space syntax analysis. These spaces consist of Museum (Former Governor Manor), Narirat school (Former leisure area of Governor Manor), and the municipal quarter. Comprise with their historic contents, public spaces in the historic city, have the most important roles in Phrae’ history. For example, Museum of Phrae city where in former time serves as reside place for rulers, built in modernization period of Thailand due to counter-colonialism (Phrae Provincial Administrative Organization 2009). It represents as European-Thai architectural style, emphasized the civilization ideology of Thailand. On the contrary, an urban axis of Phrae unrelated to religion spaces where others Lan Na cities in this study directly connect to their urban axis. In addition, Forestry school which influenced by British industrial was undertaking in northern Thailand, located in the most southern part of the city. It located on the southern tip of highest global integration line. Settlement kernel analysis shows major clusters of a settlement located in north and south part of the historic city. Almost similar to Lampang and Lamphun, Settlement concentration distinctively divides into north and south area. Overlay result shows consistent with low integration, largest cluster located in southern part, it connects to axial lines range from 0.70 to 1.31 and 0.70 to 2.76 in global and local integration, respectively. Northern cluster connected to axial lines range from 0.63 to 1.28 and 0.33 to 2.98 in global and local integration, respectively. Both of clusters connected to tips the highest lines of global integration. In addition, southern cluster located adjacent to forestry school, this result might be affected by forestry school establishment led to the cluster of settlement in the southern area. Like many living cities, nowadays Phrae still has active activities related to conservation of historic city. Even though city conservation concluded Phrae’s historic area as 2nd priority (The Secretariat of the Cabinet of Thailand 2011)—less significance of historic element—but it Land use comprehensive plan has been determined to conserve this area as Cultural identity land use like many Lan Na cities (Department of Public work and Town and Country Planning 2003b). In historic city elements, it contains significantly urban and architectural feature which some of them still in active use in recent-day however in urban street conservation plan is still unclear, this study suggests some of the streets in historic area are possible to emphasize its syntax properties and connection to public space such as Khum Doem street (Street between Ph1 and Ph2, see Fig. 7). Chiang Saen’s historic city locate in Chiang Rai province, it settles in the borderline between Thailand, Laos and Myanmar. Chiang Saen was the first origin of Lan Na historic city that located in Thailand territory. It consists of city wall which clearly appears in present-day, in three sides of a city through north, west and south by east side attach to Khong river which created a natural barrier. In the historic aspect, Chiang Saen has developed and deteriorated through political influences. Chiang Saen establishes approximately in 1288 AD by Hirankgenyang ethnic group (Lan Na ruler’s family origin) (Raunthong 2013; Siamrecorder 2005). As large plain that has a potential to be cultivated area, after Lan Na ruler—Phraya Mengrai—occupied Lamphun (Capital of Haripunchai), He commanded his descendant nephew (Prajao Saen Phu) to rule Chiang Saen (Ongsakul 2010). In that time, Chiang Saen was highly developed, city walls and city gates created. Chiang Saen also conquered by Ayuthaya (Another historic period of Thailand) in 1487 AD then occupied by Myanmar which left a city to be unoccupied and deteriorated. Finally, Chiang Saen revived in 1797, in revival period Chiang Saen return to being Lan Na’ colonial city then later time reclaim to be part of Thailand by Thai central government as one of Lan Na kingdom. Chiang Saen received influence by Lan Na, Sukhothai, and Myanmar through its time of occupation however due to seclude location, Chiang Saen deteriorates evidence still appear through its many unoccupied temples or archaeological ruins distribute inside city walls. Space Syntax analysis shows that grid system of the urban network effects to axis core by a group of main grid represent the highest value of Global integration lines ranges from 1.69 to 1.93. For the highest group of Local integration lines, it shows a precisely similar group of lines as global integration value which ranges from 3.27 to 3.39. This high integration value grid system consists of 5 connected lines in both north–south and east–west direction and creates segregate low integration lines distribute inside each grid (see Fig. 8). Low integration also appears in the boundary of the city, however, the most east and west sides lines affected by high integration lines are in intermediate value both global and local scopes. In summary, Global integration lines range from 0.35 to 1.93 and Local integration lines range from 0.33 to 3.39. Overlay result shows public spaces aggregate along with high integration lines, according to the regional office of Fine Art department, the most important temple in Chiang Saen is Chedi Luang1 temple. It established by Phraya Mengrai’s nephew (Prajao Saen Phu). Wat Chedi Luang was determined to be the center of religious at the city scale activities (Raunthong 2013). Due to unoccupied in Myanmar conquering, many temples are inactive and become ruins scatter throughout the city. However, Chedi Luang Temple may revive during Lan Na revival period to restore both spatial and spiritual of Chiang Saen city. From the result of space syntax analysis, it also confirms urban axis and its major public element such as Chedi Luang temple which also represent the subjective core of the city. Settlement Kernel analysis result shows clusters of settlement distribute throughout the city. It shows unclearly aggregation as major clusters but some several clusters are segregate in the most center area of the city. Overlay result with space syntax analysis shows settlement clusters distribute inside grid-system of high integration values in both Global and Local scope. The result shows distinctively settlement aggregation is a cluster in eastern area and gradually distribute to western area. This high group of clusters attaches to lines of integration range from 1.02 to 1.90 and 1.08 to 3.39 in Global and Local integration, respectively. From kernel analysis shows how settlement in Chiang Saen cluster in intermediate congestion of traffic due to re-habitation in Lan Na revival and Modernization of Thailand periods. Settlements of a city may discontinuity from its previous history due to the revival of temples are mostly fully recover, seen from temple ruins and/or unoccupied temples scatter throughout a city (Raunthong 2013). However, clusters of kernel analysis reviews aggregations appear in the eastern area where commercial and residential mixed together because Chiang Saen has river ports located on the east side to transport goods since establishing period. These ports distinctively affect kernel analysis of settlement to be aggregate next to commercial area emerged from river ports. Similar to Sukhothai Chiang Saen is half living and dead historic city due to unoccupied period and discontinue of cultural fabric has a severely broken heritage of local resident. Recently both government and local community try to recover and fulfil those gaps using planning regulation and various activities (Department of Public work and Town and Country Planning 2003c). As mention in settlement analysis, new development session of the city has been developed incoherence with its historical elements (Swangsri 2016). Most of the architectural elements have been completely or partially deteriorated and become archaeology grounds. However, this archaeological ground contains a tremendous value in studying history period in its time, this study reveals some urban network fabric which may develop into a center for tourism, further morphology study or archaeology priority planning. Chiang Mai was the capital of Lan Na kingdom. It found in 1296, historic area of Chiang Mai has plentiful of historic contents from being the center of converging, merging and conflict in geo-politic aspects. After defeated Haripunchai (Lamphun), Phraya Mengrai established ‘Vieng Khum Kham’ then ‘Vieng Chiang Mai’, respectively (Ongsakul 2010). Firstly, Vieng Khum Kham influence by Lamphun capital of Haripunchai kingdom, somehow, it relocated to Chiang Mai due to natural and geography suitability. Unlike other cities in Phraya Mengrai dynasty, Chiang Mai appointed to be Lan Na capital from the start (The 9th Infantry division 2006; Forbes and Henley 2012). To create the capital city, a new concept of the city need to be included, by that time, founders of Chiang Mai and Sukhothai was consulted to establish and lay concept of city shape that indicates as a symbolic and spiritual center of Lan Na kingdom (Guntang 1990; Tansukanun and Duangthima 2013). Location of Chiang Mai situates on fertile lowland in the mountain-river basin. Chiang Mai location also substantial retreat from the river due to protection from flooding and expansion buffer. Chiang Mai historic area has the significantly geometric square shape where eastern direction adjacent to the main river, western direction adjacent to the mountain that creates a natural wall to protect the city from invaders. Notice by its shape, it highly influences by Sukhothai geometric shape which also shows respects to east–west direction. Moreover, in Buddhism concept of ‘Traiphum’, Chiang Mai zoning determination divide into hierarchy usage to separate land use depend on residents’ social status. From this significant separation, it shows adopted the idea of ‘Traiphum’ suitable to emphasize capital city and simultaneously provide the semi-god status of ruler dynastic through sacred boundary (Jumsai 2008). However, during counter-colonial and pre-modernization of Thailand by centralization policy, some important spaces in historic area replaced by central government offices or quarters such as city hall, post office, city court and even jailhouse (Jarernmuang and Apavajaruta 1986). This movement, still, shows its evident in the recent day, therefore, religious spaces such as temples was immune from replacement due to its religious status and mostly situated in the same location since established period. 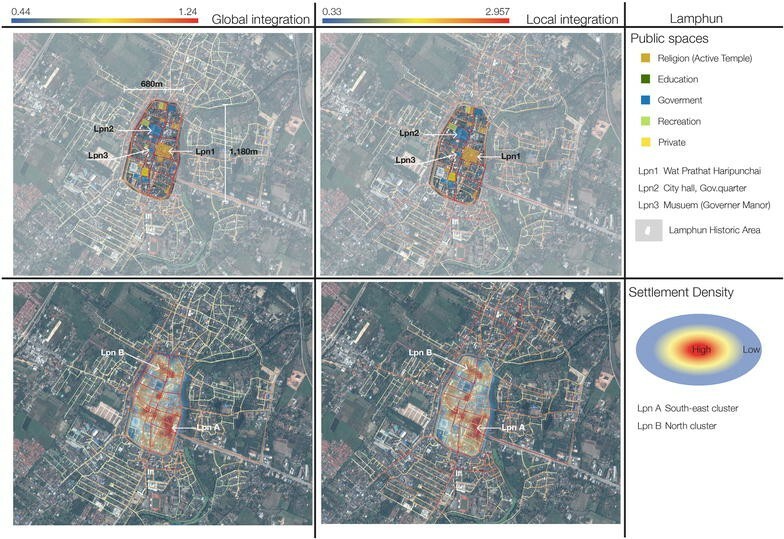 Space syntax properties of Chiang Mai shows urban axis, from highest value of global integration, consist of the center main street from east moat to central temple. This axis determined to be the main street of Chiang Mai since an early state of city establish. It comprises of the main street which directed to temple that adjacent to center in geometry. Chiang Mai main axis, clarified by space syntax axial analysis (Global integration; 1.78, Local integration; 3.635), located in east and west direction and almost divides historic area to northern and southern part. However high-value integrations both global and local scope, axial lines of high integration value permeate to the southern part more than the northern part. These axial lines have high values of Global integration range from 1.45 to 1.78, create T-shape of an urban axis. The high value of Local integration axial lines has slightly different from the global scope, besides T-shape of the urban axis, high local value group include eastern side of city moat which range from 3.18 to 3.635 (see Fig. 9). Overlay result with public spaces, explain T-shape of the urban axis of Chiang Mai. The most important and largest public spaces in Chiang Mai connect directly to the highest group of axial lines. These major public spaces consist of ‘Wat Chedi Luang’ and ‘Wat Pha Singha’, both are religious temples that even in recent-day still active and support traditional activities in city scale. Imitate from Chiang Saen, ‘Wat Chedi Luang’ determine by name and location to be highest respect and spiritual center in the city (Chotesookrata 1969). In addition, it represents as the center of ‘Traiphum’ as Sumane mountain. This belief affects its location to be in the most center of the historic area and has the highest pagoda in Chiang Mai. From space syntax analysis shows a consistent result of integration value with the location of these major public spaces. Kernel analysis overlay with space syntax analysis shows segregation of settlement cluster inside sub-network of Chiang Mai. Distribution of settlement clusters shows indifferent in term of size. In overview, most of the clusters located in southern and eastern part of city compare to opposite part. Overlay result shows consistent between the location of clusters and space syntax axial lines both global and local integrations. Similar to global scope, south, and east lines show significant conformity with kernel analysis adjacent to T-shape of highest global integration lines. However, a north–east cluster may found a better explanation through overlay with local integration axial lines. In addition, clusters of settlement in Chiang Mai clearly locate in seclude tranquil area. Result significantly shows these clusters also consist with low integration value, especially in global scope. These clusters attach to global axial lines with a value range from 1.05 to 1.25. In summary, its consistent with land-use of the city where the eastern part is a commercial area, determined since establishment period due to the proper location and simply connection by river transportation. In recent day, Chiang Mai is one of the most travel destination in Thailand due to its living heritage of capital Lan Na because of these reasons Chiang Mai has been included as a tentative list of world heritage in 2016 (UNESCO 2016). Chiang Mai’s historic city has been always included as the 1st priority of historic city list, recently, a potential in the tentative list led to highly active of both conservation plan and action of people participation in historic area to response with UNESCO’s criteria and sustainable historic preservation. Urban streets evaluated by this study display significant integration properties and highly related to auspicious public spaces in the center of historic area (Cm1 and Cm2, see Fig. 9). According to syntactic properties, it able to determining the urban conservation plan in overall aspects. Moreover, it displays settlement dwellings in the urban fabric of historic city which in a highly develop historic city such as Chiang Mai has settled in low level or sub-system of urban network. This may lead to planning policies comprise with their settlement-morphology relation such as an evacuation, social gathering, or residential planning, etc. Sukhothai was the capital of its own kingdom in an early Thailand’s history period. It is excluded in the Lan Na Kingdom; however, its city form and shape has highly influenced the other cities. It was found in 1217. The Sukhothai urban plan has adopted a concept of ‘Traiphum’. It may have considered as an early city in this region to used geometry of rectangular shape as city form. Influence by Khmer, urban elements and public spaces in as found as city ruin in recent day, shows the hierarchy of location in urban design comprised with ‘Traiphum’ concept. In Khmer planning, besides physical aspect of urban design, spiritual aspect also highly considers being included in urban elements (Jumsai 2008). These design concept has considered water feature as one of city elements that have to mean as an infinite sea of the universe, highest buildings represent continents and realms inside cosmic-ocean. Architectures in Sukhothai was significant representing an overall cosmic-ocean concept, it surrounds by irrigation moat which represents cosmic seas between each realm. However, in Sukhothai Sumane mountain is unclear due to this concept may mixed with Lan Na influence that shows in element of ‘Wat Mahathat’ at adjacent to geometry center of the city (The 8th Regional Office of Fine Arts Department, Sukhothai, 2001; Jumsai 2008), also insisted that this center of the city where Sumane mountain representative of concept is unclear. In recent day, Sukhothai has only ruin because the city has been damaged during a war in the past and unoccupied period. It might be difficult to revive the city. Somehow, city gain gradually more habitat, occasionally. In 1991, UNESCO announced that Sukhothai by most of ruins and temples are heritage site where an archaeological study is ongoing which some area is inactive and unoccupied regulate by Department of Fine art. However, the urban network of Sukhothai historic area, still, connect and attach its element with its network that may clarify in this study. Space syntax properties of Sukhothai shows the highest group global integration axial lines, display urban axis locates in the center-south area, range from 1.98 to 1.14. Almost similar to Chiang Mai, urban axis identified by global integration, created T-shape axis lines in north–south and east–west direction, simultaneously (see Fig. 10). Moreover, these lines created deform-grid of urban networks which suburban segregate inside. Despite urban axis in the center-south clusters of global lines, the highest group of Local integration axial lines appear more adjacent to the center of the city than the highest global integration lines, range from 2.33 to 2.84. In summary, compared to other historic areas in this study, Sukhothai has quite low integration value both global and local scope which range from 0.44 to 1.14 and 0.33 to 2.84, respectively. 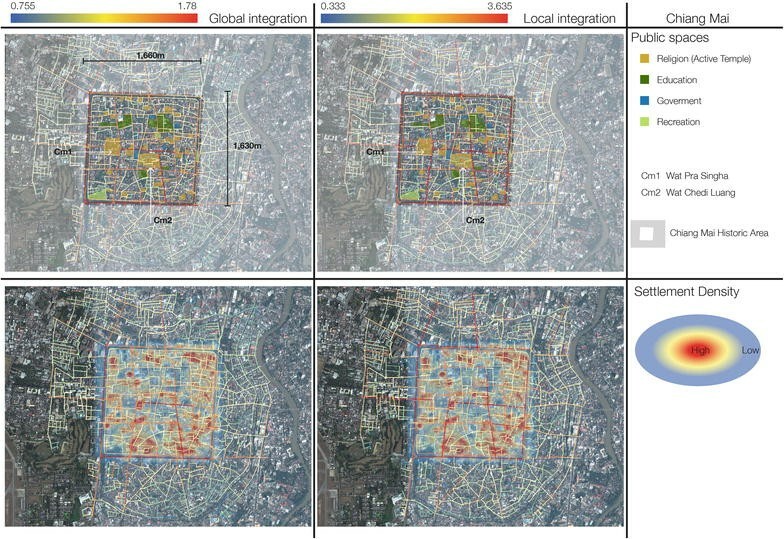 From space syntax properties result, show correlates with public spaces in Sukhothai. Most important of temples both in spatial and spiritual aspect, have connected to the highest value of axial lines. According to ‘Traiphum’ concept, Sukhothai directly influenced from Khmer cosmic imitation concept, it established since Khmer had influence in the region (Stratfor 2006; Bangkok Bank Com Ltd. 2008). Evidence in spatial feature still found in water feature where temples in Sukhothai surround by its reservoir which similar to Baray2 in Khmer religious architecture elements. After conquered by Tai, these elements adopt into Buddhism religious spaces, many temples had aggregated and replaced or established. ‘Wat Mahathat’ the most important temple in Sukhothai period that shows adopted with ‘Traiphum’ concept results in its pagoda arrangement and architectural feature, also located and connected to this urban axis. 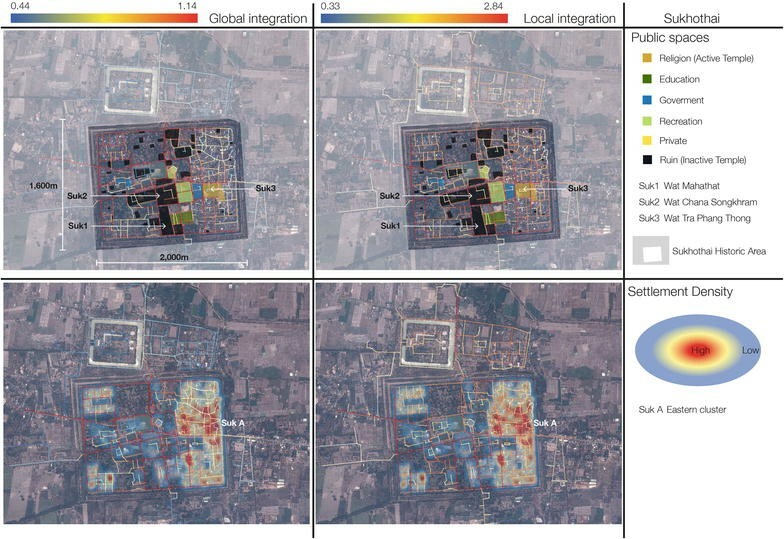 Moreover, aggregation of temples in Sukhothai significantly consistent with high-value lines of integration both global and local scope as shown in Fig. 10. Moreover, in Local integration aspect, recent day active temple ‘Wat Tra Phang Thong’ is connected to a high-value axial line. From kernel analysis of settlement, the result shows clearly aggregation of settlement in western part of the city. Due to a restriction of land-use in the historic area, Sukhothai has specific regulation in planning and prohibit to settle in the archaeological area in most part of the city. Despite main urban network, these settlements distinctively created sub-network of a labyrinth and free-form network that had integrations range from 0.59 to 0.96 and 0.72 to 2.36 in global and local, respectively. Moreover, these clusters adjacent to a high value of local integration lines especially cluster in north–east of the city. According to recently public spaces activities, these settlements conform to urban network usage due to the most of the activities aggregate in the eastern area while the western area was conserved as world heritage site. For Sukhothai, this city is not part of Lan Na cities, It was the capital of Sukhothai Kingdom but it has influenced to late Lan Na cities settlement due to its conceptual of geometry. Sukhothai provides significance perspective of historic city conservation in Thailand. It is one of three cities in Thailand that earned world heritage merit as Historic City (UNESCO 1994). However, Sukhothai is an inactive historic city, it contains valuable archaeological sites which regulated using world heritage’s criterions. The strictness of land-use in part of the city led to different urban dwelling pattern. From syntactic properties, apart from separate inactive and active land-use, the urban fabric still contains strong urban axis and related to its public spaces (both active and inactive). In this study, both syntax and settlement analysis of Sukhothai retrieved and shows significant different between active and inactive part. From the analysis, it also shows moving center of activities from Suk2 to Suk3 (see Fig. 10) which influence from settlement and regulation. For Haripunchai historic cities consist of Lamphun, Lampang and Phrae where ‘Sankh’ concept was used to create city shape and its spatial functions and spatial configuration using space syntax analysis show a similar pattern of the urban axis. In Lampang and Phrae, Urban axes displayed inner-ring in a central area of its cities which moat represent as outer-ring of urban network. Even Phrae urban network has more grid-alike than Lampang, their axis group of lines are similarity created the main network as inner-loop. In Freeform of Lan Na historic cities, Chiang Saen had different connected lines of the urban axis, it shows that grid-system of the urban network has highly related to important public spaces in previous time, even city shape is created in free-form, the main urban network is formed and display in their grid system. Consequently, the main axis conforms to this grid system network. In historic cities that adopt ‘Traiphum’ concept, Chiang Mai influenced by Sukhothai shared a similarity in their urban axis. Both of cities have urban axis line in T-shape of high integrate syntax properties in center-southern part of cities. This result shows that high integration line represents their urban axes’ shape, able to identify the distinctive shape of connected lines conformed to each city concept. Due to direction response, Chiang Mai and Sukhothai’s urban axes perform similar results, both cities high integration value deviate into southern area. Moreover, from syntax analysis, also reveals a deform-grid system in both Chiang Mai and Sukhothai. However, even their main axis is located along east–west direction shared similar layout but the Sukhothai east–west axis is completely penetrated through east–west direction while Chiang Mai main east–west axis is restrained and approached to the ‘Wat Pra Singha’ temple. This penetrated of syntax lines displays dissimilarity in city concept which applied by Chiang Mai to be different from its origin (Sukhothai). From overlay result with public spaces, every city’s important spaces significantly located attach to their urban axis identified by high integration axial lines. Despite its location on urban axis, overlay result reveals historic aspects of public spaces. Religious spaces are predominated in these urban axes; it reveals highly respect to Buddhism in ‘Lan Na’ kingdom. Arrangement or Hierarchy of important level of temples show consistent to their urban axis, especially in Chiang Mai historic cities, location of highly important temples was directly connected to high integration such as ‘Wat Pra Singha’ and ‘Wat Chedi Luang’ in Chiang Mai are directly related to location of ‘Wat Chana Songkhram’ and ‘Wat Mahathat’ in Sukhothai where T-shape line of high syntax properties located. Nevertheless, in Chiang Saen, even it has free-form city shape but its religious spaces also attach to high-value axial lines such as ‘Wat Chedi Luang’ which might be influence or shared belief in Lan Na period. In summary, Sukhothai’s religious spaces occupied largest spaces, mostly in high integrations lines. Chiang Mai and Chiang Saen show repetition culture in religious location and names. From a similar perspective, in Haripunchai cities where ‘Sankh’ concept was implemented, Lamphun and Lampang’s historic cities also shared the same location of largest temples which are ‘Wat Prathat Haripunchai’ and ‘Wat Prakeaw Dontao Suchadaram’ in Lamphun and Lampang, respectively. However, there also issue derive from this study, its distinctively appear in Lampang and Phrae, their largest public spaces occupied by non-religious usage. Results revealed that Lampang largest space that attaches to the high syntax lines is forestry industrial office, it distinctively shows political power in colonialism period while teak wood industries occupied and influenced in the region consistent with its history. Phrae’s largest public spaces also occupied by wooden manor built for rulers of Phrae during flourish of forest industries, this manor was created in wooden colonial style architecture influenced by western architecture by that time. In addition, in every historic city, governmental spaces occupied adjacent to their urban axis high integration syntax properties, depend on a different level of modernization and cities function in their development to recent day. Public spaces had highly influenced by political or religious viewpoint, in this study especially cities that have conflicted in multiple issues such as colonialization. These conflicts and/or converge, still, reveal its own physical evident which consistent to its urban network until recent-day. In settlement kernel analysis, every city shared a similar pattern of settlement comprises with space syntax results, settlement clusters are settled in tranquil and calm traffic where low integration located. Furthermore, settlement clusters adjacent to high local integration lines revealed that even residents settled in tranquil traffic of lines but they also generally settled close to high traffic lines to easily travel through the entire urban network. These settlement pattern clustered labyrinth axial lines of urban networks. Results indicated that residents occupied these urban spaces by 2 major factors, Tranquil and calm neighborhood and adjacent area that responsive travel to high-integrated lines which indicated a high volume of activities in its urban axis. For urban morphology of analysed cities, the elements of the city have been revealed using space syntax of an urban street, the location of public spaces, and kernel density of settlement. Analysis of urban form clarified in more detail using a qualitative method of a street by the ranking of the urban axis that co-exists with settlement in gradual density analysis. Shape and form of this study determined by establishment concept and evolve through time which conforms and express to its central public space(s). More importantly, the complexity of a city unable to assess only by quantitative tools or part of the element but the whole part with historical content must be assessed to deeply understand the logic of evolution in its morphology as a part and a whole, simultaneously. The subject of history is obtained and conceived in each object element of urban morphology to provide better understanding and may create appropriated comprehensive conservation planning. In Lan Na kingdom, Concepts of city shape has been converged and combined, this study shows urban axis identities using space syntax with overlay technic on public spaces and clusters of settlement kernel analysis. This study a has limit on a number of cities that evaluated in this paper chosen from various type of city shape, to make concrete result for implementation, present-day spatial configuration through its urban network has been evaluated. 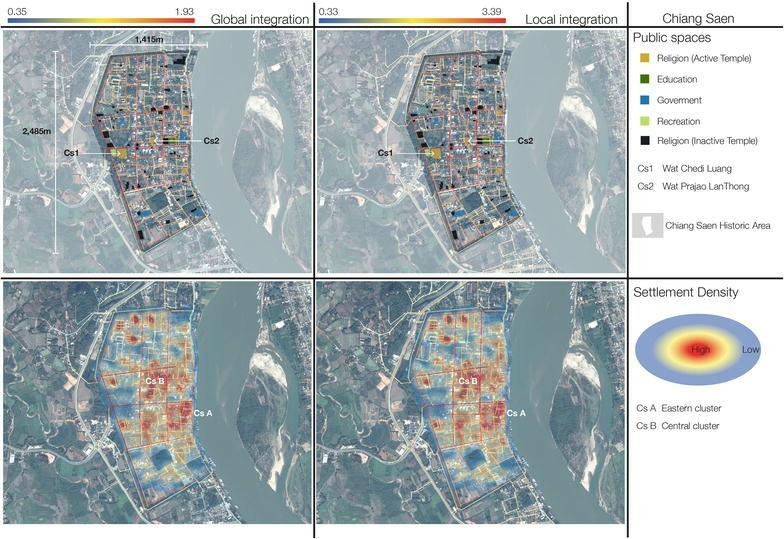 This study selected of Lan Na historic cities and Sukhothai historic city where the boundary of the city is distinctively seen from its moat to evaluated spatial configuration with its socio-political aspect. A study reveals consistency with space syntax methodology as a proven tool to identified urban axis which also revealed its history and socio-politic through GIS overlay. These urban axes of Lan Na historic cities show significance result consistent with their concepts and historical contents. These urban axis identification shows indigenous idea to create viable communities using natural-imitation concepts in ‘Sankh’ or ‘Traiphum’. These concepts represent through its function as religious spaces as a spiritual center or transformed spaces to response with political issues. For Lan Na kingdom, it significantly shows high respect to Buddhism from these spatial arrangements. Including, political aspects, some cities adapt this center response to its political pleasures that transition through time. To encourage the atmosphere of historic cities, these results can prioritize important of urban network, it can develop appropriate measures as planning or urban design guideline concerning about urban axis improvement. According to public spaces related to its history aspects, Improvement or spatial upgrading in conservative cities have to concern about these highly valuable historic heritages. More understanding and studying these elements are, still, in need. Nevertheless, studying how residents settle in its morphology is also should be clarified, simultaneously. Additional issues of urban networks may derive from a delicate method, to conserve urban history, present-day spatial aspect has to be measured to identified transition and development of the city which may affect the efficient spatial policy of city according to its own settlements pattern. Luang; in Lan Na’s vocab means enormous. Usually used to describe subject or object that has the most important. For example, in this study, Chedi Luang means big and/or important pagoda (Chedi means pagoda both Lan Na and Thai language). Baray is one of identity auspicious architectural spaces in Khmer empire. It is reservoirs in Khmer temple, Baray usually has a rectangular shape, oriented east–west. These elements were important as its represent cosmos oceans in Hindu belief. 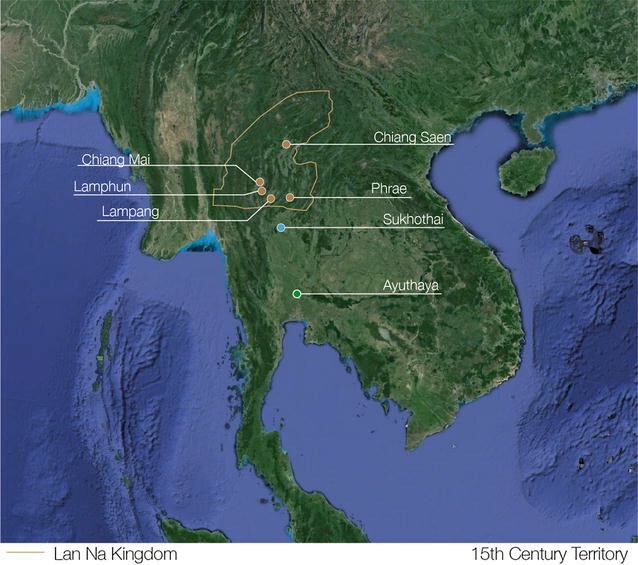 NS conducted the analysis, interpreted the conclusion, and contributed to the mapping of Lan Na historic cities. NM conceived of the study, participated in supervising and developing the methodology, in reviewing, and revising the manuscript. All persons designated as authors qualified for authorship, they sufficiently in the work to take public responsibility for portions of the content. NS as corresponding author takes responsibility for the integrity of the work from inception to published article. Both authors read and approved the final manuscript. Authors would like to express deeply gratitude to the Department of Civil Engineering and Architecture, Saga University for Doctoral student position during the research conducted. We wish to confirm that there is no known competing interests associated with this publication and there has been no significant for this work that could have influenced its outcome. 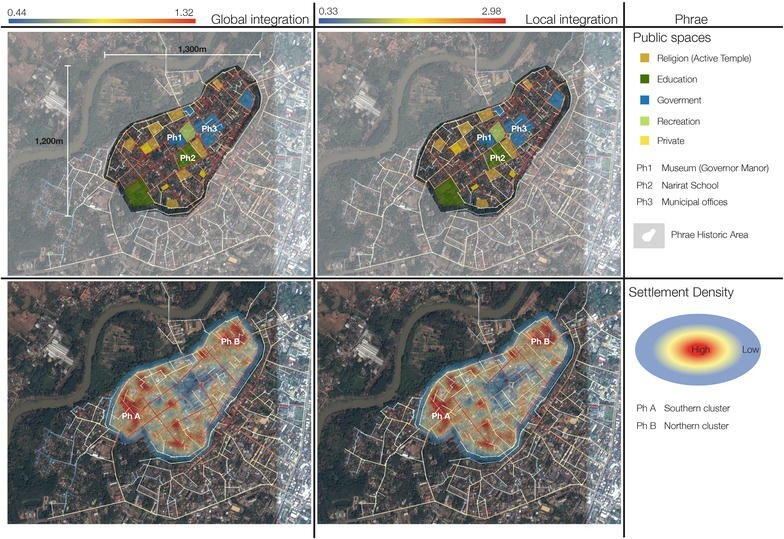 The datasets supporting the conclusions of this article are available in the figshare repository (unique persistent identifier and hyperlink to datasets in https://figshare.com/projects/Settlement_analysis_of_Lan_Na_cities/22207). This paper is supported by the JSPS KAKENHI Grants, Number JP16H04478. The grant supports in the body of collecting and analysis of data.